The walking robot which founders called Mantis is result of continued four years’ work of engineers from the Micromagic Systems. The idea on creation of monster belongs to Matt Denton, the chief developer of the walking robot. Mantis is a design of the impressive sizes. Height of a design makes 2 meters 80 centimeters, and it weighs 1900 kilograms. The robot is equipped with a special cabin for the driver, the 2,2-liter turbo diesel engine and hydraulic system. Movement is provided with six massive feet and a number of sensors, which number includes power sensors, sensors of an angle of rotation and the tilt angle measuring instrument. Operation of the hydraulic drives located in feet of the robot, the software developed specially for this device supervises. There is a small display in the closed single cabin, on which comes the current information regarding the condition of the robot. Also it is supposed that it will possible to operate the robot not only by the operator, but also through Wi-Fi. The robot not only freely moves in space, but it removes subjects lying on a way. 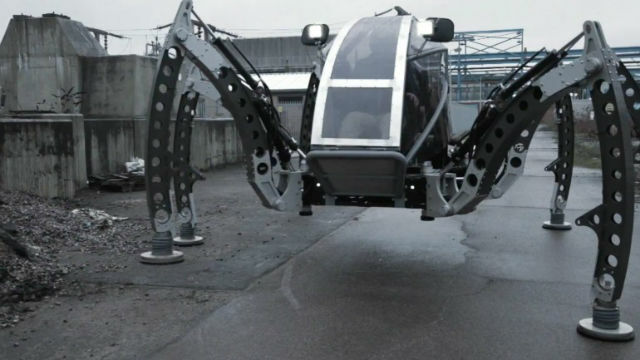 From all walking robots Mantis is the biggest in the world. Newborn robot already has a potential competitor: the team of engineers from Massachusetts works over creation of the robot of the same sizes at six feet. The project is called as Stompy. But Denton is still sure, that Mantis will be the most popular walking robot, which the person will be able to operate.